Here are ten experiences to be had in Lyon, for an amazing, memory-filled stay. Let yourself be enthralled, enjoy yourself, go for a stroll and enrich your culture - Lyon, voted Europe's Leading City Break Destination at the World Travel Awards, has much to offer! Here are ten experiences in Lyon that are sure to make your stay an amazing and unforgettable one. Hop into the cable car and admire the city from the panoramic viewpoint on Fourvière hill. To see the city like a local, take the "ficelle", a funicular railway that serves Fourvière hill. Rise above the rooftops, and see if you can recognise the buildings in the tiny city below. In fine weather you can even see the snow-capped Mont Blanc on the horizon! The Basilica of Notre-Dame de Fourvière, which has come to symbolise Lyon, overlooks the city from its vantage point high on the hill that goes by the same name. It was built in the 19th century, and its interior decorated with mosaics and gilded features is a constant delight to visitors. Wander through the traboules in the Vieux-Lyon and Croix-Rousse areas. Have you ever seen a traboule? These passageways are typical of Lyon, and were designed to link two parallel streets by passing through buildings and inner courtyards. They are open to curious visitors in both areas! 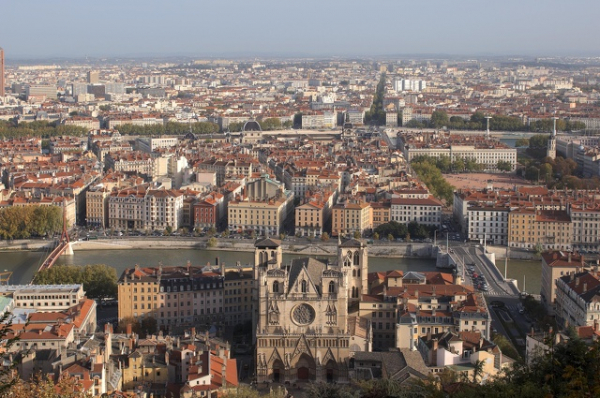 Having witnessed more than 2000 years of history, Lyon’s city centre has been listed as a UNESCO World Heritage site since 1998. There are many treasures for visitors to discover, from the ancient site of Fourvière, to the narrow Renaissance streets of Vieux-Lyon, the silk workshops of the Croix-Rousse and the squares and monuments of the Presqu’île district. Nothing compares to our guided tours to discover all the hidden secrets! There's a wide range of specialities to be had in the city's famous bouchons! Try a Salade Lyonnaise (a salad that includes hard boiled eggs, bacon pieces (or chicken liver) and croutons) or Cervelle de Canut (fromage blanc seasoned with herbs and shallots), and for a truly authentic experience, look out for the "Bouchon Lyonnais" quality label. 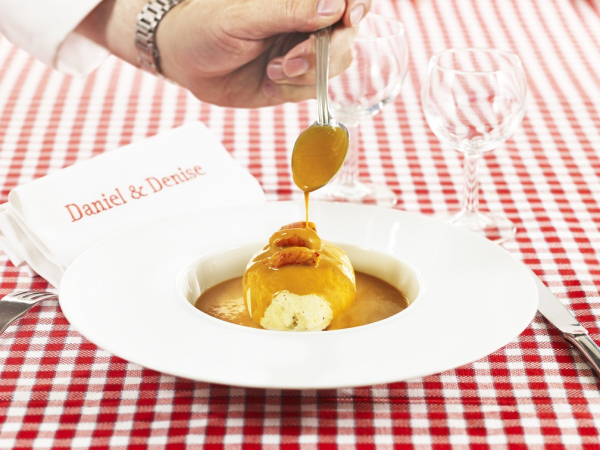 It guarantees that restaurants prepare their food in keeping with Lyon's traditions, and regularly serve the classic morning meal known as a "mâchon". As the World Capital of Gastronomy and city of the famous chef Paul Bocuse, Lyon offers an incredibly rich range of cuisine thanks to its 4,000 restaurants, and boasts a reputation supported by gastronomic restaurants, talented young chefs devoted to producing creative fare, and century-old brasseries. Croix-Rousse is a very old district once inhabited by silk workers known as Canuts. 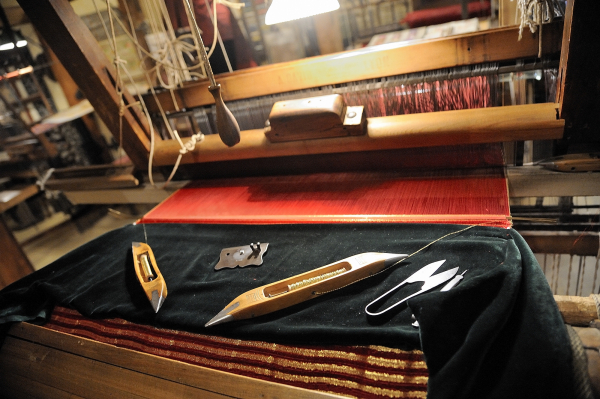 Here you'll get to discover workshop-boutiques where you can buy a silk scarf at manufacturer's price, and discover the silk trade, from the weaving process to adornments. As a creative city marked by this flourishing industry, Lyon is now also the ideal shopping destination. From the city centre to the shopping complexes, you'll get to discover a whole host of shops and malls offering a shopping experience that's 100% Lyon, with luxury products, large department stores and trendy designers. 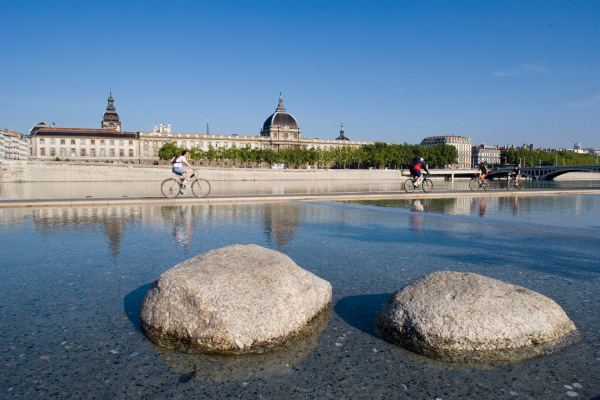 Grab a self-service Velo’v bicycle and head off along the banks of Rhône to discover their bustling, urban atmosphere. Then set off in search of the city's monuments before enjoying an open-air break on board one of the many barges moored along the river! The banks in the northern part of the city will take you to Tête d’Or Park, with its free zoo, lake and botanical garden. This is Lyon's beating heart and the largest urban park in France, and greatly contributes to the quality of life that has been so well preserved here in this city built on a human scale. 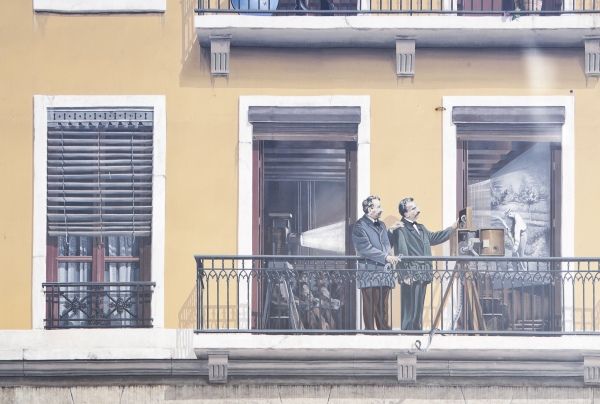 The Fresque des Lyonnais Célèbres, a trompe-l'oeil reproduction on the façade of a house on the banks of the Saône, pays tribute to 31 local celebrities. With characters such as Antoine de Saint-Exupéry and his Little Prince, and the Lumière brothers, here's your chance to spot as many as you can. In many ways, Lyon resembles an open-air museum, and its murals and trompe-l'œil paintings relate the history of both the city and its inhabitants, lending poetry and an element of surprise to this charming urban landscape. Make the most of the early morning hustle and bustle, and get to taste a piece of Saint-Marcellin cheese or Rosette sausage. This covered market will give you the opportunity to buy all the very best local specialities. And why not take some home to share your culinary experience with friends and family! Les Halles de Lyon Paul Bocuse is a temple dedicated to gastronomy, and will even take you on a voyage through neighbouring areas to discover their famous terroir products. Because Lyon's excellent reputation in matters of culinary delights also depends on the quality of its regional products, such as the famous Poulet de Bresse and Beaujolais and Côtes-du-Rhône wines. Rue du Premier Film in the Monplaisir district was the setting of the very first film in history entitled "La sortie des usines Lumière". Just a few steps away, in their former family home, you'll be told about the lives of Auguste and Louis Lumière, and the various stages that resulted in their great discovery: the cinematograph! From the works of art in the Musée des Beaux-Arts (Fine Arts Museum) located in an ancient convent to the treasures to be found in the Musée des Tissus (Textile Museum) nestled in a private townhouse, some twenty museums cover a wide range of unique and varied topics. And all are included in the Lyon City Card! Stroll along the Saône to discover the former Port Rambaud with its rehabilitated industrial buildings in contrasting shapes and colours designed by some of the world's greatest architects. Highly symbolic of this revival is the orange cube by Jakob + MacFarlane, which is a great backdrop for a spot of photography! Having been restored to the locals after centuries of industrial activity, the Confluence district is now symbolic of an eco-friendly city firmly focused on the future. Extend your tour to the southern limits of the Presqu’île where the Musée des Confluences features futuristic architecture and invites visitors to go back in time to discover the story of mankind. 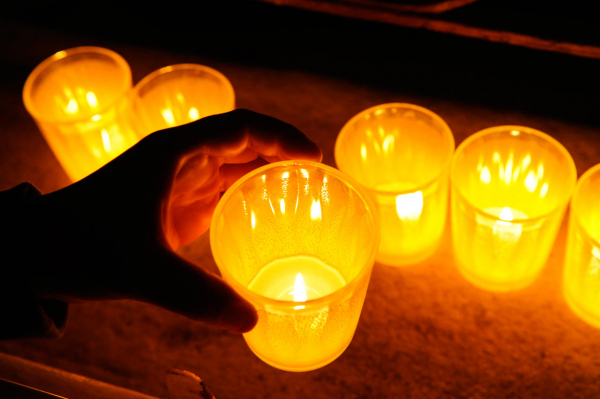 On the 8 December, the inhabitants of Lyon are in the habit of perpetuating a tradition of placing candles on their windowsills. This has even become an unmissable event called the Fête des Lumières (Festival of Lights) that attracts visitors from all over the world for 4 evenings of popular festivities with sights that light up the city. The city of Lyon is internationally recognised in this field, and adorns itself with light every night of the year, highlighting its monuments at nightfall to create a romantic and magical atmosphere. Download the pdf version of these 10 experiences!